I said last week that I'd grown up hearing stories from my parents about their respective childhoods. Their stories were usually funny and, because they took place in a different time (the '60s and '70s) than I knew and, in my dad's case, in England instead of Canada, listening to them was like having a whole world opened up. Roald Dahl does that (although with perhaps less of a familial pull) in his first memoir, Boy: Tales of Childhood. 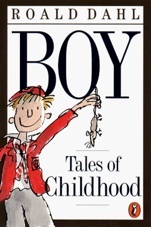 Boy is the story of Dahl's childhood in England and summers in Norway. I've written about his later memoir, Going Solo, but I wanted to do Boy separately because the tone is quite different. Dahl's childhood memories are quite similar to the stories he wrote for children. Although he says all the tales in Boy are true (and I have no reason to doubt that, exaggeration notwithstanding), Dahl likes to cast his stories in certain ways. There is almost always a villain - especially if the story is about school - and the villain is always ugly. This works well for children, and suggests that for Dahl, people's appearances match their personalities. That's one of the reasons Dahl made for such a great children's author: he left the moralizing and the explaining out of it. In Boy, Dahl tells the tales of his punishments with indignation and anger, which is just the way a child would feel. That he resists looking at the other side, or trying to justify the actions of his teachers, puts Dahl squarely in the camp of authors who really remember what it was like to be a kid. He doesn't look back at childhood and idealize it so much as look back and relive it (although his stories have almost certainly benefitted from a looser grip). Of course, Dahl leaves out the more awkward moments of growing up and hitting puberty - although maybe those are more a staple of the female coming-of-age memoir, I don't know. The stories Dahl tells are the exciting ones: how he and his friends snuck a dead mouse into a candy jar, how he replaced his half-sister's finance's pipe tobacco with goat poo, how he broke his nose. That's not to say that he doesn't include some more general details – the summers he spent in Norway, writing weekly letters home from boarding school – but he wrote this as a memoir for his audience of child readers, and the focus reflects that. As an adult reader, it makes for a generally hilarious, always interesting, collection of stories. Dahl always knew how to play his audience, and Boy is no different. Dahl was a grown man when he wrote this novel, and his reminiscing offers adult readers the opportunity to think back to their own childhood and pull out only the good stuff. Boy isn't a long book, which suggests a lot was left out, but since it's about Dahl's childhood, why shouldn't he pick and choose what bits were truly memorable? For that matter, why shouldn't his readers? Must be an enjoyable read Boy: Tales of Childhood by Roald Dahl. loved the way you wrote it. I find your review very genuine and orignal, this book is going in by "to read" list.